Thai people look at a large chunk of metal found on a beach in Nakhon Si Thammarat province, Thailand, Jan. 24, 2016. "It is very likely that the debris which has been discovered in Thailand is part of a rocket which MHI launched from Japan in the past," said Kengo Tatsukawa, public relations manager for Mitsubishi Heavy Industries (MHI) after VOA notified the Japanese company of the find. The 2-by-3-meter barnacle-encrusted chunk, weighing about 100 kilograms, was discovered Saturday by fishermen after it washed up at Pak Phanang in Nakhon Si Thammarat province, about 800 kilometers south of Bangkok. The site faces the Gulf of Thailand and the South China Sea. A Thai aviation team led by an air force vice marshal, as well as Malaysian officials, headed to the province on Monday to inspect and collect the item, according to local news reports. The placement of bolts and numbers etched on it resemble the honeycomb launch fairing of a Japanese H-2 rocket series, a liquid-fueled launch system used to transport satellites and space probes. Also, "the construction and placement of ports seem to match" the rocket, said Nathan J. Hunt, an independent aerospace and defense blogger in the United States. "There are part numbers and serial numbers on every piece of a rocket so it should be able to be traced back to a particular launch," said Lance Gatling, president of Nexial Research, an an aerospace and defense consultancy based in Tokyo. Further investigation would be necessary to confirm precise details, such as matching it to a specific launch vehicle, but no such plans have yet been made, Mitsubishi Heavy Industries' Tatsukawa, in Tokyo, told VOA. MHI has yet to be contacted by authorities in either Thailand or Japan about the item, the spokesman noted. The H-2A first flew in 2001 and the H-2B's first flight, from Japan's Tanegashima Space Center, was in 2009. The condition of the item found on the Thai beach, which also has insulated red and white electronic wires on it, indicates it had been in the ocean for a year or more, according to specialists who have viewed video and pictures of it posted online. "The species of barnacle could give a hint where this drifted from and how long it has been in the water from the distribution of barnacles on the debris," Hunt told VOA. The H-2 rocket stages are designed to drop off and fall back to Earth as they separate after launch on a trajectory that takes them over waters far south of Japan and east of Philippines. "It could not have re-entered anywhere near Thailand," Gatling told VOA. 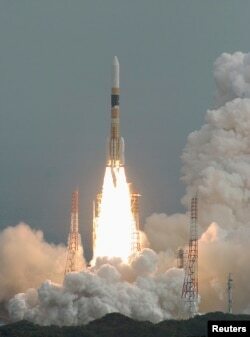 FILE - An H2-A rocket carrying Japan's fourth spy satellite blasts off from the southern island of Tanegashima, Feb. 24, 2007. Malaysia transport minister Liow Tiong Lai told reporters that the Department of Civil Aviation had been instructed to contact their Thai counterpart for verification amid speculation that the part could have been from the MH370, which disappeared nearly two years ago en route from Kuala Lumpur to Beijing. The search for the missing jetliner has focused on an arc of the southern Indian Ocean, off western Australia and thousands of kilometers away from Thailand. The only evidence that has been found was a 2-meter-long flaperon wing part, which washed ashore in July of last year on a beach of Reunion island in the Indian Ocean. The find in Thailand follows the discovery of four large spherical objects found in Tuyen Quang province, Vietnam this month. Those objects are debris from an 8-ton stage of a Russian- Zenit rocket which re-entered over Southeast Asia, according to the Spaceflight101. The rocket, carrying a weather satellite, lifted off from the Baikonur Cosmodrome on December 11 last year with the second stage re-entering the atmosphere and breaking up over Thailand early on January 2. Last November, an approximately one-meter piece of debris plunged into the Indian Ocean near Sri Lanka and also speculatively linked initially to MH370 has been identified as most likely that of a rocket motor which propelled the NASA Lunar Prospector probe in 1998, according to asteroid tracker Paul Chodas at NASA's Jet Propulsion Laboratory in California.